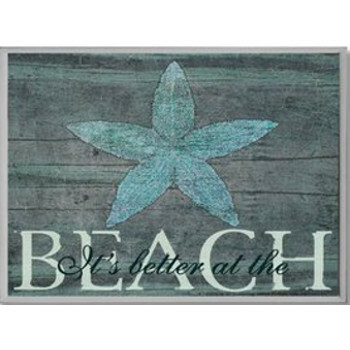 The plague reads "It's Better at the Beach" with a starfish in the center of a driftwood background. This is a attractive way to let everyone know Where You'd Rather Be. This plaque features a lithograph of original artwork mounted on 1/2 inch thick mdf fibreboard. Hand finished sides and sawtooth hanger on the back for instant hanging.